Why is Angola’s capital the most expensive city in the world? 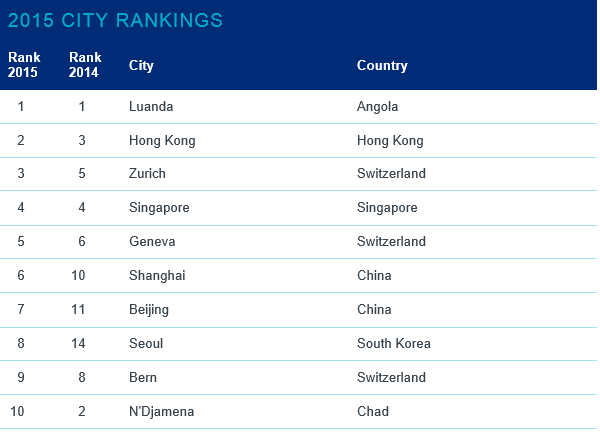 According to Mercer’s annual “cost of living” ranking, that was released today, Angola’s capital Luanda is the most expensive city in the world, ahead of more usual suspects like Hong Kong, Zurich, and Singapore. In financial terms: to rent a two bedroom apartment in Luanda, you will pay on average an astonishing $6,800 per month, the FT reported. How is that possible? Angola’s GDP per head is just $7,700 per year. In other words, the average Angolan would only be able to rent a two-bedroom apartment for one month of the year. Surely the math doesn’t add up? Indeed it doesn’t. But that doesn’t mean the numbers are wrong. It merely means we’re comparing apples and oranges. In the list, cities like Zurich, Geneva, Bern as well as Singapore and Hong Kong are where we would expect them to be: up top. These cities, after all, are located in some of the richest and thus most expensive countries in the world. Hong Kong has a GDP of $53,000 per capita, Switzerland does even better with $57,000, and Singapore, finally, has a whopping GDP per head of $78,000, putting it on the global top 3 of wealthiest countries, just behind Luxembourg and Qatar. It is no surprise then that the cost of living there reflects the income of its people. But it is more surprising to see cities like N’Djamena, Chad or Luanda, Angola in the list. Why is that? The first answer, is that the Mercer list looks at the average cost of living for expats. That means the cost of living for the average Angolan, Swiss or Chinese are left out of the calculation – at least theoretically. In other words: the cost of an apartment in Luanda for an Angolan household may well be just $200 a month. But that cost is discarded when looking at the cost for expats. In the case of Luanda, and many other cities in emerging markets, expat cost of living varies wildly from those of locals for two fundamental reasons: supply and demand. First, consider the supply. Angola, a country rich in natural resources, was until a decade ago affected by a bloody civil war spanning almost three decades. Over the course of the civil war, an estimated 500,000 civilians lost their lives, and much of the country’s poor infrastructure was destroyed. So when in 2002 Angola could turn at last to rebuilding its economy and society, its initial supply of high quality housing was most likely limited at best. Thanks to its oil reserves, Angola grew at a breakneck speed after the civil war, with annual GDP growth peaking at a mind-boggling 23% in 2008, and exceeding 10% per annum 5 out of 6 years between 2003 and 2009. But while economic growth might recover extremely fast, construction tends to be more of a longer term evolution. In other words: the cost of housing might go down over time, as the supply of quality housing increases. There is a demand factor at play too. Cities like Luanda and N’Djamena aren’t often referred to with endearing nicknames like “the Eternal city” (Rome), “the City of Light” (Paris) or “the City that Never Sleeps” (New York). It’s more likely they aren’t known by people at all, in fact. That means there is not a big appetite among expats to move there. In the past decade, tens of thousands of American and European employees of international oil conglomerates, fortified by generous cost-of-living allowances, have descended on Luanda. […] The country now produces 1.8 million barrels of oil a day; in Africa, only Nigeria produces and exports more. The boom has transformed a failed state into one of the world’s fastest-growing economies. In other words: Luanda may not be the most expensive city in the world for the local population, but thanks to a booming oil economy, a limited supply of luxurious housing, and a high demand for it among expats, the cost of living there is higher than any city in the world.